I recently inherited this clock and was told it was my fathers great great aunts. I am not to sure of that but that is all I know. I have a beautiful wall/shelf clock and it looks exactly like the antique clock by Joseph Ives, design of 1818. It is a pendulum, scroll top clock with brass urn finials, turned columns and painted wooden dial. 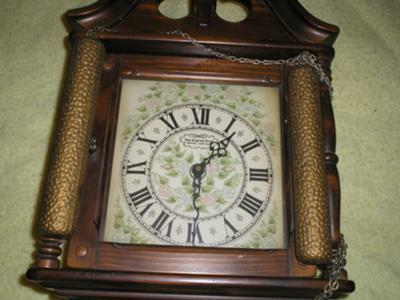 It has a lower reverse painted glass showing a scene, 15 minute chimes and manufactured by The New England Clock Co., of Bristol, CT. I would like to date it and find out the value. I bought it at a tag sale 25 years ago. It is a key windup clock and has the paperwork. I really am very curious about this clock. It is in perfect working condition. I feel it is from the 40's or 50's but not sure. If you can help me, I would appreciate it. 8-Day Spring-wind Westminster. Made by New England Clock Company Identification Number 218C. That's all I know I would like more information if possible also somebody said its a New England Wind Chime Clock but I can't find any information on this clock. Please Help. Signed, Needing Clock Knowledge. I was gifted with this clock in 1983, by my loving grandmother just before her death; I know it is a New England Clock, Made in Farmington, Conn in 1974. This is the obvious Print on the face of the clock, but the Distinct Label enclosed Reads: 14 Day Cathedral Gong, Spring wound Regulator No. NE 266G. On the rear panel a Ink stamp reads C NECC 75. I have seen no examples of this clock thus far, but it looks hauntingly familiar for some reason? Was it mass produced, or is the regulator just throwing me off? I wish to know anything including value in today's market, and its potential at auction. Never will I sell it, I just find it interesting, and believe it to be valuable if for no other reason, just because Granny loved it. I never located receipt, no actual purchase price, please help. 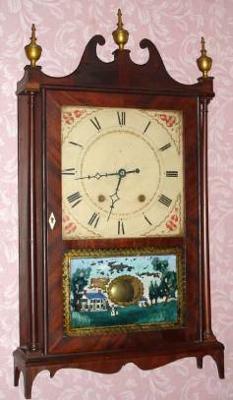 I CURRENTLY INHERITED A NEW ENGLAND CLOCK 218 C EIGHT DAY SPRING WIND -PICTURE ON FRONT - HOME TO THANKSGIVING. DOES ANYONE KNOW HOW OLD THIS IS AND THE VALUE? IT ALSO WORKS AND IS IN GOOD CONDITION. My clock is a New England bell chime clock, made in Farmington, Connecticut. Model No 270c. The inside mechanism reads made in West Germany 131-080. It is key wind up operated. It, as far as I know, belonged to my father-in-law and perhaps his father? Does anyone know anything about this clock? It's an New England chime wall clock, it's got pull chains on it, and it says " Hark, what's the cry, prepare to meet thy god today". I found this clock at a used store. I bought it works great with a C battery. It is lovely. The glass on the outside of the facing on the clock you can lift to set the time. The pedulum swings nicely and keeps perfect time. I think it is solid oak. The facing of the clock says new england clock company Famington, Conn. U.S.A.
Do anyone know how much this clock is worth? 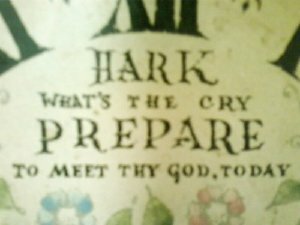 I Have A Hark Whats The Cry Clock Could You Tell Me What Its Worth Today. I Recieved It As A Gift Years Ago.I See You Have A Picture Of It On Line. 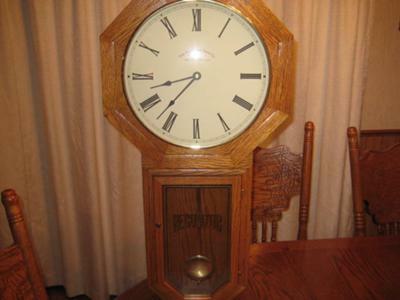 I have a pendulum clock made by The New England Clock Company, "Home To Thanksgiving", model number 218C. It was a retirement gift given to my father in 1979. He passed away over a year ago, and I was wondering if anyone has any information on this clock. N. E. Clock 2106 ? All I know is that is a New England clock company clock model 2106. Wondering an age range on it. It is in mint condition and works perfectly. It appears to be quite old but other than that I don't know much else about it. Reply from Bill - The New England Clock Company was started by W. K. Sessions, of the Sessions Clock Company,in 1958. They remained in business until 2006. During this time, they made thousands of different clocks. To really know the time period or type of clock you have, I would need more detail. You can post it here by clicking on "Add a Comment to This Page" below. If you have a picture, post it in a new submission and I will try to help. If I don't know, someone else here might. Early mother's day morning my two boys were out playing and found a clock put out for the trash by someone. Being 10 year old boys eager to please their mother, the two of them managed to carry it home and give it to their mom. She was thrilled of the thoughtfulness and we just decided we wanted to find out more about the clock. We know it was made in 1970 by the New England Clock Company and it is an 8 day chime, spring-wind clock. I have attached a picture. We would love it if you could respond to us and let us know more about it. It stands about 5.5 feet tall and has see through glass in the center portion of the cabinet. 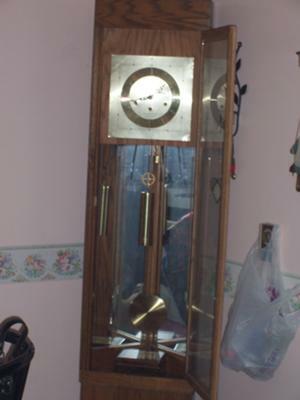 Im not sure if this is considered a grandfather clock because it is so much smaller than usual. If someone knows anymore we would love to find out. I don't know much about it. It is a wall clock and has two weights hanging from chains. 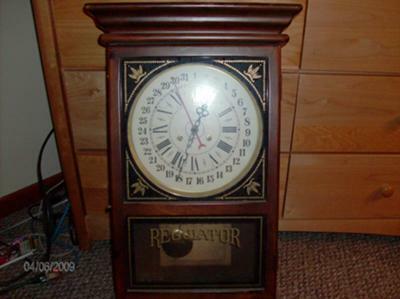 If anyone knows anything about this clock I would appreciate knowing more.